The Open University (OU) has released the 2014 edition of its ‘Innovating Pedagogy‘ report, the third edition of an annual educational technology trend report. While the timelines may remind you of the Horizon Report, the methodology for gathering the trends is different. The NMC Horizon Team uses a modified Delphi survey approach with a panel of experts, the ‘Innovating Pedagogy’ report is authored by a team of OU researchers. This year’s edition focuses clearly on instructional strategies, not technology. Edublogger Stephen Downes has both praise and criticism for the report: “while it is capable of insight (such as the discussion around threshold concept’ it has the flaw of predicting events that have already happened (‘flipped classroom’, ‘learning by storytelling’) and predictive hackney (‘learning to learn’)”. 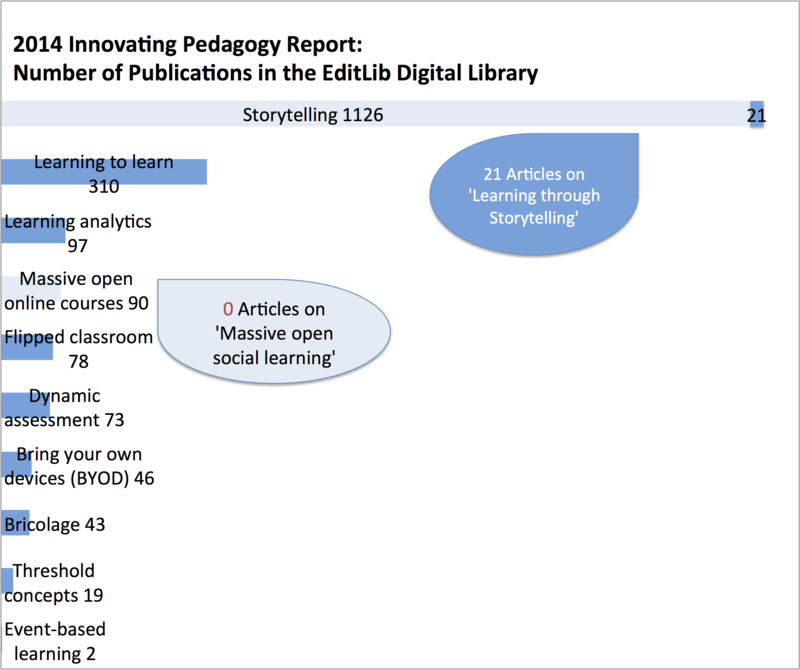 As the search results indicate, storytelling approaches are indeed widely used throughout the educational technology community – though we could only find 21 articles with the exact term ‘learning through storytelling’. Phenomenons like ‘Flipped classroom’, ‘Learning analytics’ and ‘BYOD’ have been discussed widely in the blogosphere. However, there are still not too many publications on the subject. Though we retrieved 90 contributions on ‘Massive open online courses’, our search yielded no results for ‘Massive open social learning’.